This classic, old fashioned, quick and easy vanilla cake recipe from scratch is homemade with simple ingredients is soft, moist and fluffy. Great with vanilla frosting or chocolate frosting. Since my Best Vanilla Cupcakes are so popular with family and friends, I knew I had to share this traditional cake recipe with you too. This recipe never fails and uses the most basic ingredients that I bet you already have in your pantry. 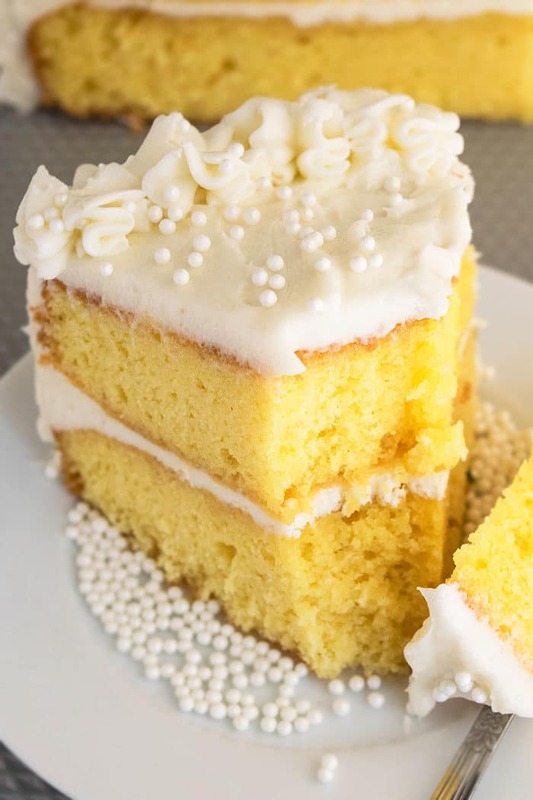 Are yellow cake and vanilla cake the same? 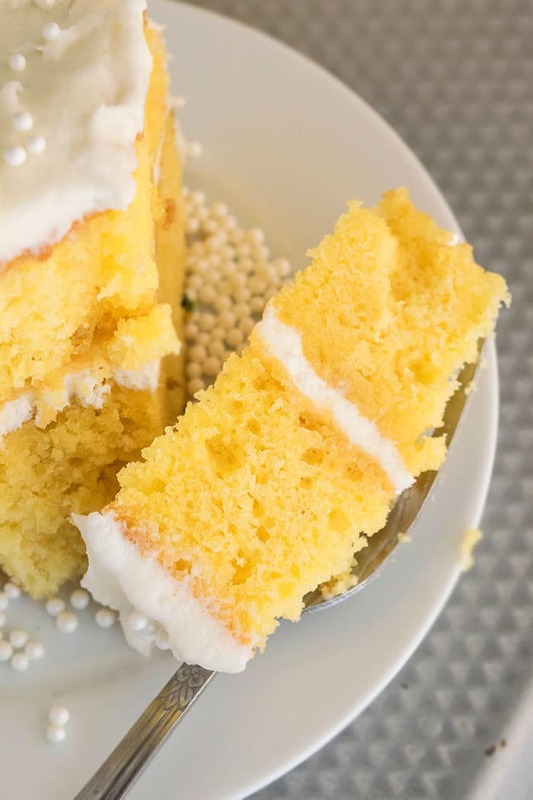 Is there a difference between white cake and vanilla cake? 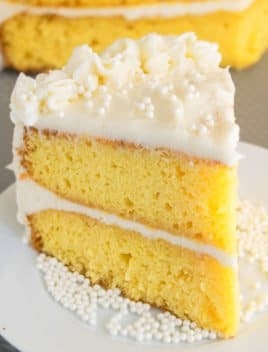 Technically, vanilla cake can either be a white cake or yellow cake. A yellow cake uses egg whites and egg yolks, giving it a natural yellow color. 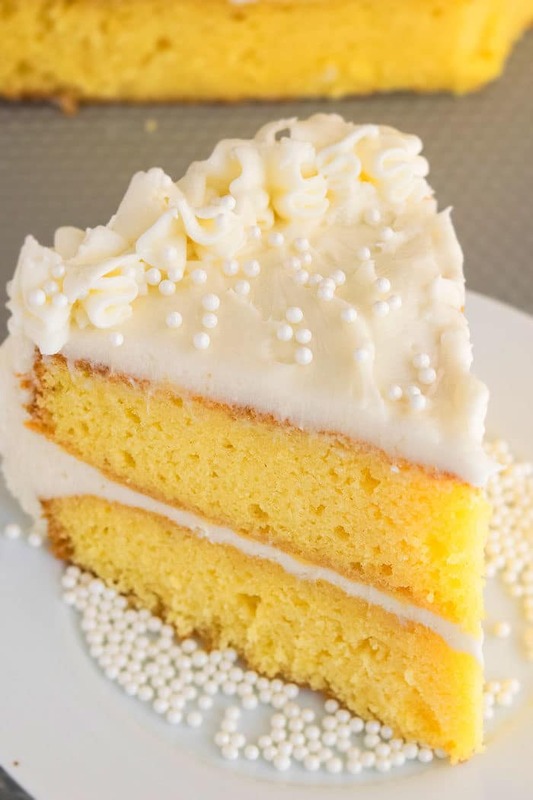 A white cake only has egg whites and has a white crumb. Both of them have a vanilla flavor. So, it all comes down to the use of eggs and the overall color of the cake. How do you make a cake light and fluffy? Don’t over-mix cake batter- This is the most important thing you can do! The fluffy cake texture is a result of the air bubbles that you whip into the batter that end up expanding in the oven during baking. However, if the batter is over-mixed, those bubbles end up collapsing and the cupcakes don’t fully rise and can sink too. That’s why you should only mix the cake batter until just combined. Measure ingredients properly– Because baking is science and those measurements and ingredients combine together to create the best fluffy texture. What makes a moist cake? Moisture comes from rich ingredients that are high in fat. So, use full fat buttermilk. Use butter, eggs and oil. Don’t do any substitutions or replacements with low fat ingredients. How to make best vanilla cake recipe from scratch? Cream together butter, oil, sugar. Add eggs, vanilla, buttermilk and keep aside. Mix together the flour, baking powder, baking soda. Dump dry mixture into wet mixture and mix. Pour batter into round pans. The classic choices are either American vanilla buttercream frosting (recipe below) or Chocolate Buttercream Frosting or Cream Cheese Frosting. However, you can even use fruit-based frostings (which are great for Summer cakes) such as Maraschino Cherry Frostingor Orange Frostingor Strawberry Buttercream Frosting or even Mango Frosting. If you want to get creative, you can even try my Marshmallow Frosting or this White Chocolate Buttercream Frostingor this Coconut Cream Chocolate Frosting. All ingredients should be at room temperature– That’s because they blend together smoothly and evenly. Add more layers– Double the recipe and make a taller 4 layer cake. Decoration– Keep it simple and classic with just white frosting swirls and white sprinkles (edible pearls). 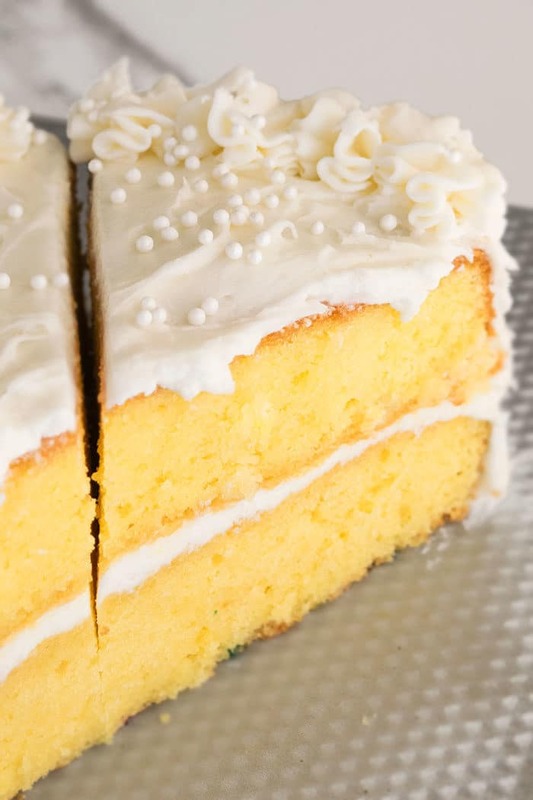 Temperature is key– Do not start assembling and layering your cakes until they have fully cooled down or else the frosting will melt all over the cake and make a sticky mess. Use unsalted butter- This prevents the cake from becoming too salty. Both, butter and oil must be used– Don’t replace one with the other because using both together creates the best texture. Using only butter makes the cake very dense. Using only oil causes the cake to lack in that special rich butter flavor. Quality matters! Use best quality of vanilla extract you can find for best flavor. Rodelle and Nielsen Massey are both great brands. Both, baking powder and baking soda are used- Don’t replace one with the other because they both work together to help the cake rise. Only use all-purpose flour– I have tried making this cake with other flours but none have been successful. Don’t over-mix cake batter– Because this will yield a tough and it can also cause the cake to collapse/sink during baking. Get creative! Add different extracts and zests to change the flavor of this cake and pair it with different flavors of frostings. The texture will still remain the same but a small change like that can allow you to make this cake for many different holidays and seasons. Homemade buttermilk– I know this is not something we have on hand all the time but no worries. Make it at home by mixing together 1 cup whole milk with 1 tbsp vinegar or lemon juice. Let it sit for 5 minutes. Mix and then use in this recipe. This classic, old fashioned, quick and easy vanilla cake recipe from scratch with simple ingredients is soft, moist and fluffy. Great with vanilla frosting. In a large mixing bowl, cream together butter, oil and sugar until fluffy. Add eggs, vanilla extract, buttermilk and mix until smooth. Keep aside. In a separate mixing bowl, whisk together the flour, baking powder, baking soda. Dump this dry mixture into the wet mixture and mix until just combined. Don’t over-mix!!!!! Pour batter into 2 greased and floured round cake pans (Dimensions: 8×2). Bake at 350 degrees for 35-40 minutes or until an inserted toothpick in the center comes out clean. Allow the cakes to fully cool down. Then, place one cake on a cake stand and ice the top with frosting. Place the other cake on top and press gently to stick the two cakes together. Use Tip 1M to decorate a border around the top of the cake. Sprinkle edible pearls all over the cake. Enjoy!